Growing up, I was never too fond of mushrooms. To me, their only purpose was to ruin a perfectly good pizza. As I got older, I started to warm up slightly toward raw button mushrooms in salads – with enough dressing, that is. But it wasn’t until I experienced my first taste of fresh shiitake mushrooms (Lentinula edodes) – introduced to me sautéed in butter – that I truly began to understand their intrigue. Their rich, almost smoky flavor, could transform any dish into something spectacular. It was with the shiitakes, locally grown on a small Panhandle farm, that I finally developed my love for mushrooms. They could be added to so many dishes – simmered alongside chopped garlic, or in broth, a reduction of wine, or cream. Toss shiitakes with pasta, add in lieu of meat in a creamy risotto, or use them to enrich a soup or quiche. I learned that shiitake mushrooms are not only delicious, but they are packed with nutrition, including fiber, protein, multiple vitamins, calcium, as well as an excellent source of antioxidants. But what I really found fascinating is how shiitake mushrooms are cultivated. To understand their production, you must first understand that mushrooms are merely the fruiting body, or sexual organs, of the fungi. Mycelia, which is the vegetative portion of the fungi, colonize logs and only form spore containing mushrooms when they are ready to reproduce. 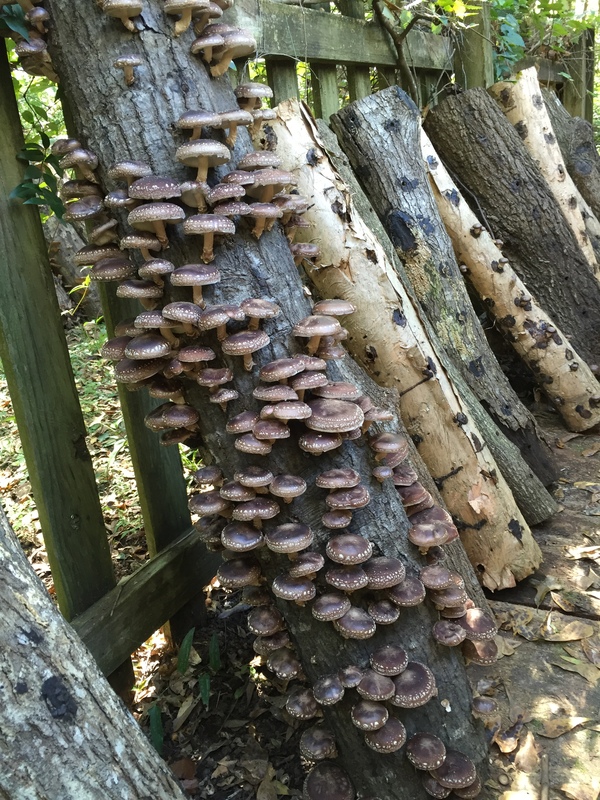 The Florida Panhandle is an excellent location to grow shiitake mushrooms, as they strongly prefer to grow on oak tree logs, such as laurel oaks, which is a hardwood species native to our area. The logs must be fresh to avoid colonization by unwanted fungi, so producers must first cut down oak trees during fall or winter, when the trees have large amounts of stored carbohydrates. It is important to do this sustainably, ideally as part of a forest thinning. The trees should be about three to eight inches in diameter and should be cut to about four-foot lengths. The next step is to inoculate the logs with shiitake spawn. You can purchase shiitake spawn as either plugs or sawdust form. It is important to get a strain that does well in our climate, so make sure to do some research, such as learning about strains through the North American Mycological Association. To inoculate, drill holes into the logs and insert the spawn with a plunger, a hammer, or a turkey baster, depending on the form of spawn. The holes should then be coated with hot wax to protect the spawn from drying out and from becoming contaminated. 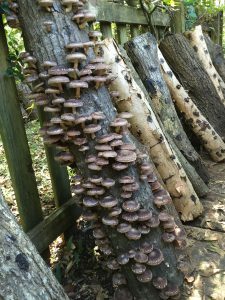 The logs then incubate under shade with proper moisture and aeration for about six to 18 months, giving the mycelia time to colonize the log, which includes digesting decomposing organic material to absorb nutrients. The mycelia will fruit for about a week, and will then need a rest period of eight to 12 weeks before fruiting again. Logs fruit for about four years, but are typically more productive in the second and third year during the spring or fall. Harvest the mushrooms daily by cutting them at the base, and place in a box and refrigerate until use. By immersing the logs in cold water or chilling in cold storage, you can encourage the logs to fruit, but this process may make your logs less productive over time. When the bark begins to slough off, production will slow down and eventually stop. 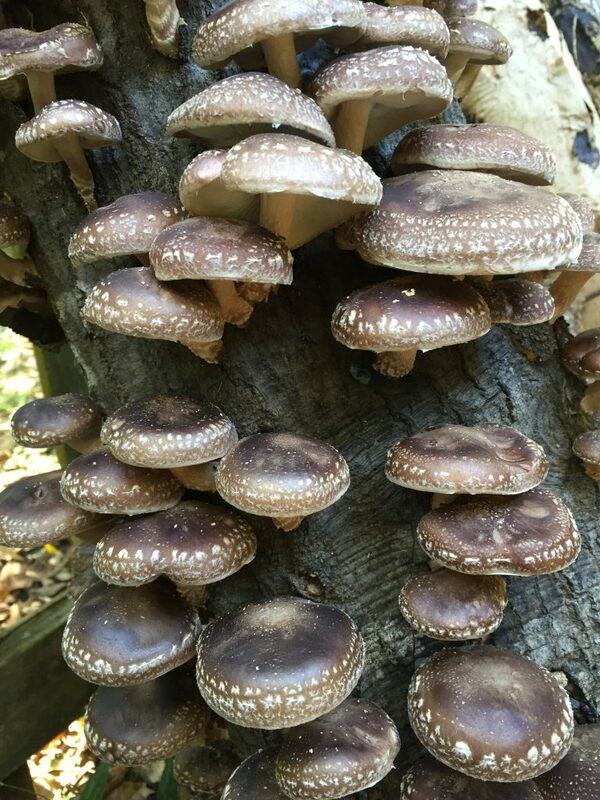 For more information on growing shiitake mushrooms, visit the UF/IFAS Small Farms Mushroom Production website. 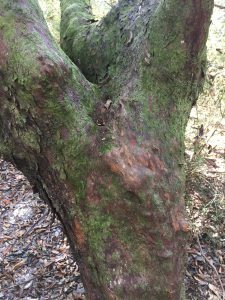 During a recent hike through wooded property in Walton County, our Florida Master Naturalist class came across a stunning example of an American Beech tree (Fagus grandifolia). As we looked closely at its thick, sinewy trunk (often compared to an elephant’s skin), the bark changed hues from a deep red to silvery gray and brown. A hardwood, it has been used over the years to make furniture, railroad ties, and beer barrels. Like many of the local hardwood species, beech wood holds up to decay when exposed to water and early settlers used it to build mills and water wheels. 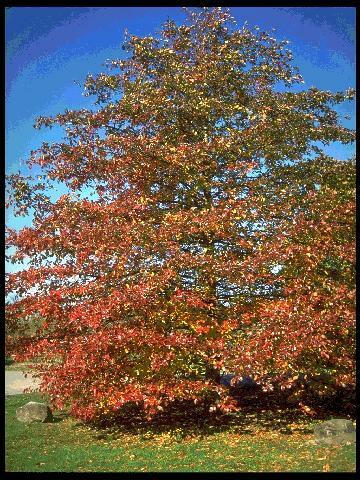 During the growing season, the beech tree can be identified by its distinctive dark green, tooth-edged leaves. Beeches are deciduous but have the unique quality of usually keeping dead leaves on their branches all winter, which also helps with identification in the forest. The most fascinating observation, to me, was the series of tightly swirled branch buds ready to sprout at the tips of each new branch. So pointed that they’re easily confused as thorns, these long protrusions will eventually grow into new branches. 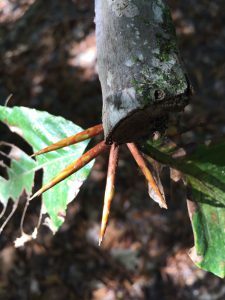 At the end of one branch that had been cut, the tree’s internal “emergency response” system formed four new immature branches, which had the intimidating appearance of a claw. Eventually, one of these buds will outcompete the others and grow into a new branch. Beeches are of course known for the beech nut, eaten by humans and wildlife alike. If you’re considering a beech for a home landscape, be sure you have a wide open space with moist soil, as a mature beech can grow up to 75 feet high and 40-60 feet wide. Its low branches create a lot of shade, so understory plants are usually unnecessary or even impossible to grow. 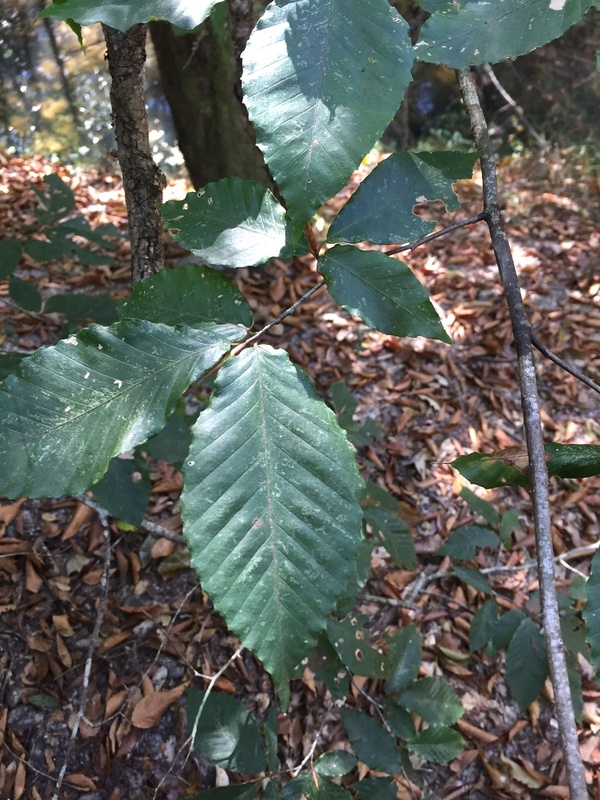 For more information on these interesting native trees and others like it, contact your local UF IFAS Extension Office or visit the UF Landscape Horticulture page. Something’s Been Eating in My Yard! Missing rose buds, pulled up pansies, and damaged tree trunks are all signs that something has been visiting your garden while you are away. But what could it be? 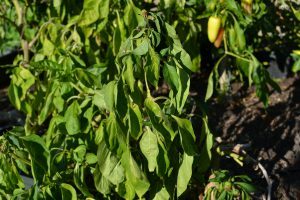 Most gardeners are familiar with leaf spots caused by fungal diseases or minor feeding damage by insects, but to see half a shrub or an entire flower bed demolished overnight indicates a different type of pest. There are several mammals that visit home landscapes and may cause damage, especially in times of drought when natural food sources are limited. Because we provide water for our landscapes, our plants tend to have lush new growth at times when plants in natural areas have slowed growth because of a lack of water or other stressors that managed gardens do not face. So, it’s no surprise that herbivores will be attracted to our landscape for a midnight snack. It is important to determine what is causing damage so that you can employ protective tactics if possible. Some things to look for to try to figure out who the culprit is are footprints, dropping, feeding clues (bite marks, scrapes, etc. ), or other distinctive damage. 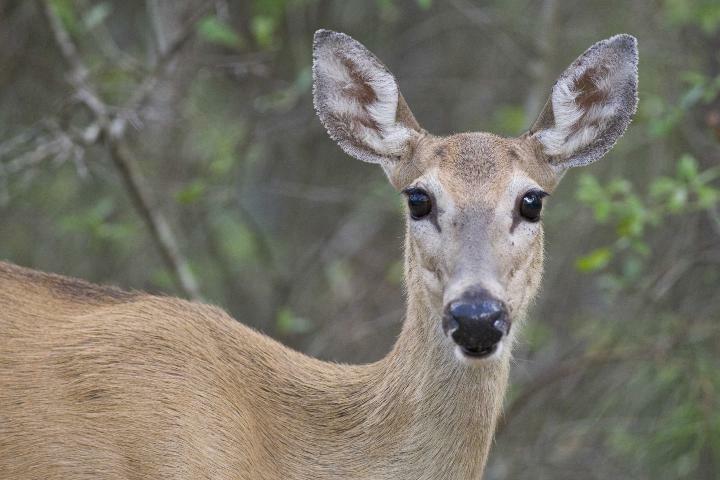 For more details about how to tell the difference between damage caused by multiple pests see How To Identify the Wildlife Species Responsible for Damage in Your Yard. Plants have specific ways of telling gardeners that there is a problem, but not all plant symptoms lead us directly to the cause. 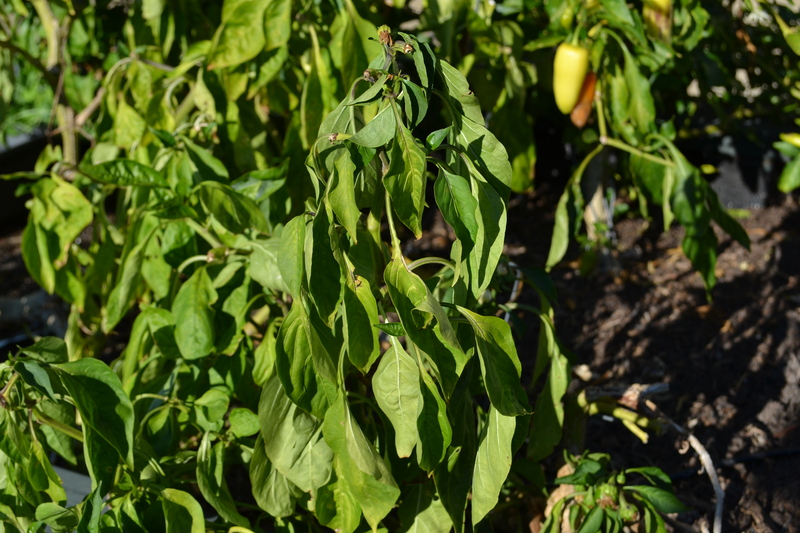 During drier conditions, we often use wilting leaves as an indicator that water is needed. This can be a reliable symptom that the soil is lacking moisture but it is not always the case. Wilting leaves and herbaceous branches actually tell us that there is not adequate water in the plant. It does not necessarily indicate lack of moisture in the soil. There can be many reasons why water is not being absorbed by roots and moved to tissues in the plant. The obvious place to start is by checking soil moisture. If soil is powdery several inches deep around the plant, water is likely needed. 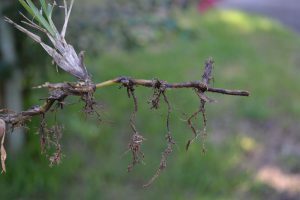 However, if you ball the soil up in your hand and it holds together, there may be another reason for lack of water reaching the upper plant parts. The harder part is determining why the root system is not taking up water. 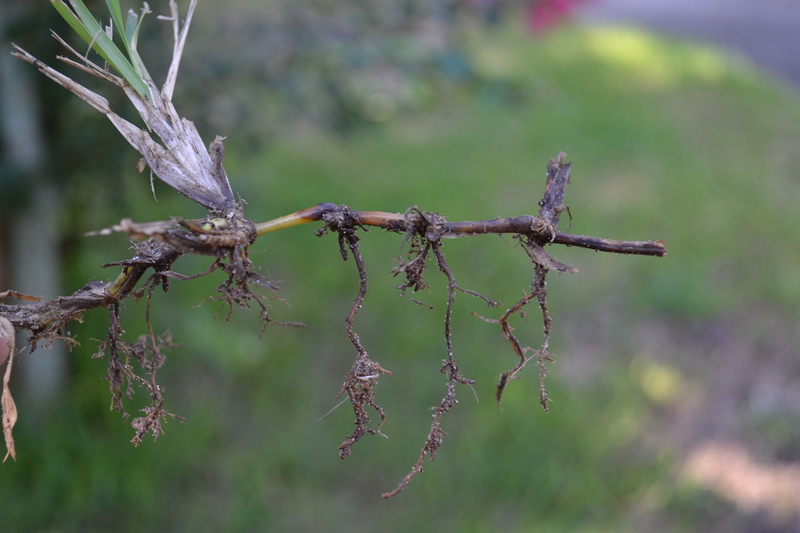 Causes can be a rotted root system from too much water, a poorly developed root ball that has circling or kinked roots, and even problems in the soil such as compaction. Insects, diseases, and other pathogens can also injure root systems preventing the uptake of water. So before automatically grabbing the hose or turning on the sprinkler, do a little soil investigation to make sure that the plant wilt is really indicating lack of water in the soil. If you need help in your diagnosis, always contact your local Extension office. Want Fall Color? Plant These Trees ! Florida has so much to offer! It is home to the world’s most beautiful beaches. It has one of the largest agricultural economies nationwide. But among all these things, Florida is lacking in one area that is very noticeable come fall: all the beautiful red, yellow, and orange leaf colors that paint the autumn landscape just a few hours to the north! This holdover from the Jurassic Period (Literally! Fossil records indicate Ginkgo has existed virtually unchanged for well over 100 million years!) 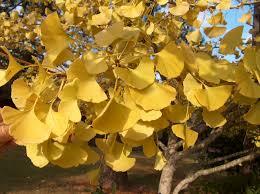 has much to offer as an ornamental tree, including spectacular golden-yellow fan-shaped leaves in fall! Somewhat ungainly in youth, a mature Ginkgo is truly a sight to behold, an 80-100’ tall, imposing specimen. Ginkgos are very tolerant of all soil conditions except waterlogged, have few insect and disease pests, and are remarkably drought-tolerant once established. Be sure to select a male cultivar however, as female trees produce extremely odiferous seeds that remarkably resemble rancid butter! 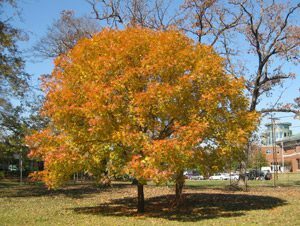 A little-known, much underused tree in the Deep South, Chinese Pistache will light your landscape aflame with brilliant, orange-red fall foliage. One of the last trees to turn color in the fall, Chinese Pistache can help extend the show deep into November! It is a small to medium sized tree that will not overwhelm any but the smallest landscapes. As with Ginkgo, the habit of the tree in youth is awkward at best and the tree’s full potential is not realized until maturity when it becomes a dense, oval-round specimen. Chinese Pistache is close to bulletproof, tolerant of drought and poor soil conditions. One of Northwest Florida’s best native trees for fall color is Black Gum. Black Gum is a standout tree, pretty in all seasons, possessing dark, almost-black bark, a tall pyramidal habit and vivid fall foliage in the deepest shades of red and purple. As a bonus, Black Gum usually begins its color change very early, occasionally in September. The addition of this tree to a lawn dominated landscape can deliver at least an extra month of color! Black Gum prefers moist, deep soils but is found in dry flatwoods and swamps alike, betraying its adaptability. Including the above trees in new or existing landscapes is an easy, smart way to extend the fall color show from September through November and make home gardeners long a little less for the colorful northern autumns! Happy Gardening!